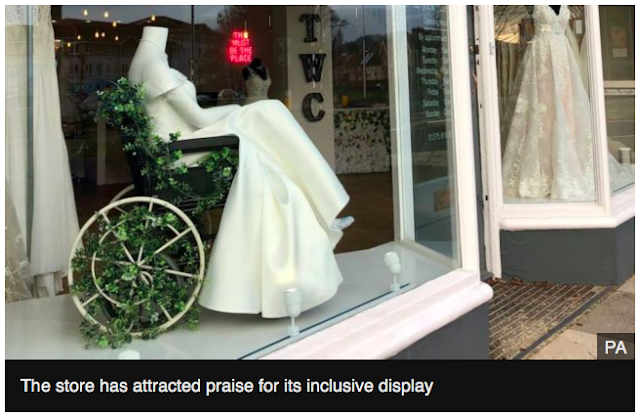 In the news recently a bridal shop has come under praise for having a window display with a mannequin sat in a wheelchair, and whilst this is amazing and is showing inclusivity of disability in the retail industry instead of celebrating should we be asking "why isn't this the norm?". Artist and TV presenter Sophie Morgan (who herself is a paraplegic) has designed a product called the 'Mannequal' - "a wheelchair for mannequins that is both a style guide for wheelchair users and a symbol of inclusivity". But as well as wheelchairs why can't other disabilities/impairments be shown in the retain industry. Sure having a mannequin sat down give you an idea of what clothes are suitable if you're in a seated position (something that I'm faced with myself when clothes shopping). But What about the scope for mannequins with prosthetic legs or an arm amputee like the model Kelly Knox who won the modelling show 'Britain's Missing Top Model'. Of course only visible disabilities can be shown but I think that mannequins who are "differently normal" and represent disabilities/impairments should become the norm as after all there are over 11 million people with disabilities/chronic illnesses/impairments in the UK*. All-in-all I think that the retail industry has a long way to go, but little gestures like the bridal shop and stores using things like the 'Mannequal' are making progress in representing consumers with a disability.